Outlet.com.sg is the ultimate shopping portal to get good deals at huge discounts in Singapore. From gorgeous travel destinations, to best restaurants, exciting activities, and value-for-money beauty services, they feature new deals daily at an unbeatable price. What really makes Outlet stand out from the other deal websites in Singapore is the fact that they offer only good quality deals. The folks at Outlet are not just offering cheap deals. They are reshaping the whole experience of value-for-money luxurious deals. I had the chance to try out some of the deals offered on Outlet, and it includes all you can eat Thai buffet, lavish Japanese feast, relaxing spa massage, and a luxurious villa stay in Bali. With Outlet, everyone can go for nice holidays without spending a bomb. $519 instead of $1040, 50% off 3D2N stay at Ranadi Villa in Seminyak, Bali by Villas International Property. The deal includes Daily Breakfast + Private Pool + Spa Treatment + 2-Way Airport Transfer. Where else can you find a 3D2N villa stay for this price? Even though the Ranadi Villa deal has already ended, you can check out the other deals on Outlet. Currently, they are offering a 3D2N stay in Nusa Dua retreat boutique villa resort for only $499! I had a great time in Seminyak, Bali. The restaurant scene is simply amazing – there are so many nice restaurants with stunning interiors and good food. We stayed in Ranadi Villa and the service was impeccable. Deal-of-the-day sites are redefining travel. But Outlet tops it all by giving you luxurious deals at affordable prices. After this experience, this is no way I will settle for a normal suite or hotel when I go to Bali the next time. I shall work harder to earn more money and book a villa from Outlet. Among the travel deals that they are offering, there are villas, cruises, 5 star hotels and packages to places like Bangkok, Hong Kong, Osaka and Taipei. I think surfing Outlet’s travel deals page is a sin. All the deals are urging me to click the “Buy Now!” button. Oh my god. I’m really tempted to book a villa for a getaway next year! Outlet currently has two ongoing Bali villa deals – you have no excuse for not going on a holiday!!! It is impossible to save money when you feel the urge to travel all the time. But luckily for us, OUTLET offers fantastic travel deals at huge discounts. Besides travel deals, Outlet also has many value for money dining deals. I swear they are plotting to make me broke and fat at the same time! What better way to throw away that diet plan than to go for a buffet? Suanthai is a Thai restaurant at Killiney road, which is known for their cheap and good Thai buffet. Choose from 28 Thai dishes including Green Mango Salad, Tom Yam Soup with Prawns, Famous Thai Green Curry and Chicken wrapped in Pandan Leaf. San-sui Sumiyaki & Bar at One Fullerton is a good place to go for grilled skewers. The menu has a good selection of meat and some of the stand-out items include: Black Pork Belly ($6), Baby Lamb Rack ($10), Chicken with Leek ($5), and Beef with golden mushroom ($12). Besides skewers, they also serve sushi ($8-20) and sashimi ($20-25). $20 for $40 worth of dining voucher! What can I say? This is a steal! Hurry, gather your friends and go for a Japanese feast! Perched at the top of Shaw Centre, The Ultimate Penthouse has a stunning view overlooking the entire Orchard Road. If you are looking for somewhere for a good massage, then The Ultimate Wellness Haven is definitely on top of my list. The Ultimate Penthouse at Shaw Centre is one of the best luxury spas in Singapore. The Ultimate spa is already sold out, but you can check out the $69 instead of $360, 81% off 90-Minute Massage for Couples by Urban Spa. Outlet also allows you to use their web coupons by showing it on your mobile to the merchant. Say NO to printing! Let’s do our part for Mother Earth. 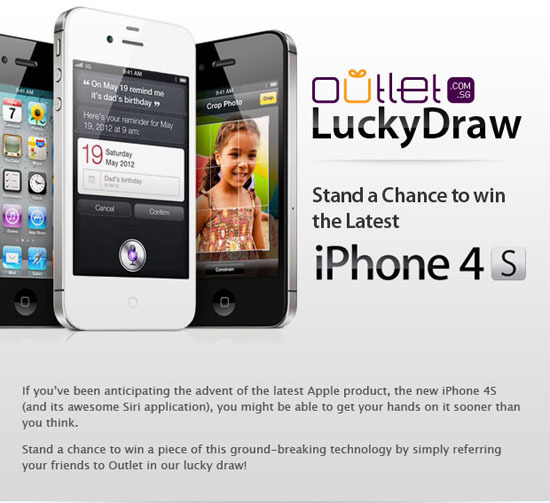 All you have to do is like their facebook page, participate by clicking “buy now” on the iPhone lucky draw deal and proceed to check out, log into your outlet account and refer your friends to the lucky draw. More details about the giveaway here. You might want to post an update on this post and other relevant posts, if any. Outlet.com.sg has closed down and is in the process of liquidation.